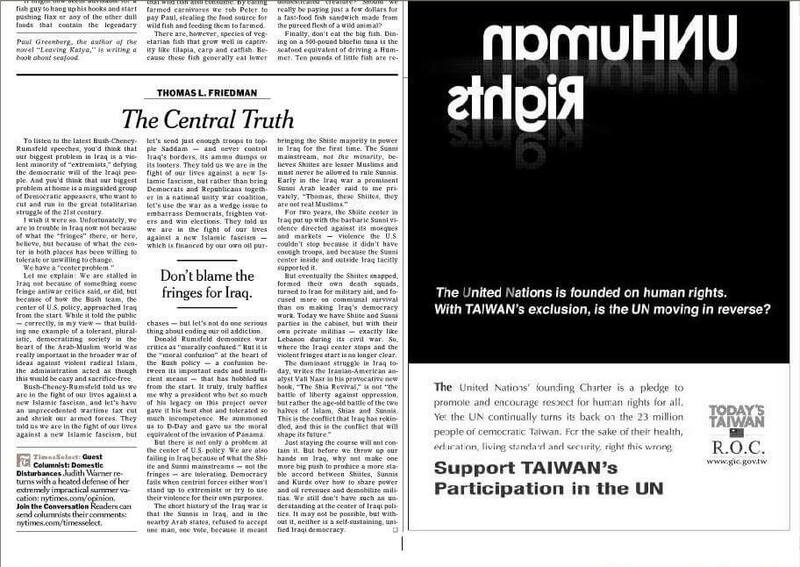 BEFORE I STARTED THE 1ST TRANS, DEFINITELY I FOUND A TERRIBLE AD RIGHT TO THOMAS L. FRIEDMAN’S ARTICLE IN TODAY’S A29 OP-ED PAGE OF THE NEW YORK TIMES. OUT OF ANY IDENTIFICATION OF AMERICAN, CHINESE, CHINESE AMERICAN OR AMERICAN CHINESE, I OPPOSED TAIWAN’S INDEPENDENCE, WHO’S A REGION OF REPUBLIC OF CHINA ONLY. The United Naitons is founded on human rights. With TAIWAN’s exclusion, is the UN moving in reverse? promote and encourage respect for human rights for all. education, living standard security, rights this wrong.